Stairways that go or come from nowhere loose their functionality and possibly their raison d’etre. Stairways that don’t go anywhere are also counterintuitive. As such they are designed to activate in viewers unusual associations of ideas and possibly a higher level of critical thinking. 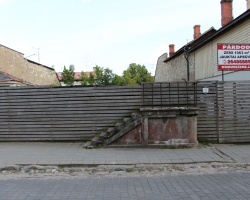 In Tallin’s old town a stair was to be demolished with the rest of the building. I suggested to conserve it, to be used as a vantage viewpoint of the coming construction site. 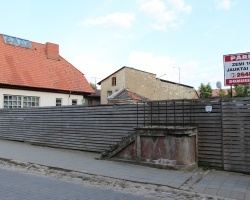 The temporary board fence erected round the building site was to be carefully fabricated to accentuate the contrast between the old crumbling staircase and the expectation of the future contemporary volumes. In contrast, for dsquared’s new headquarters in Milan I designed a grand staircase going down from the the street level and bouncing against a plain wall: a sort of amphitheater without a stage. On the side I added a touch of theatricality with a heavy grey curtain, which is just as incongruous as there is no window behind it, just a recess in the wall.